Garage space is often hard to come by, but with an outdoor portable garage, you can get the safety and protection that your vehicles need without the expense and hassle of adding more space on to your garage. 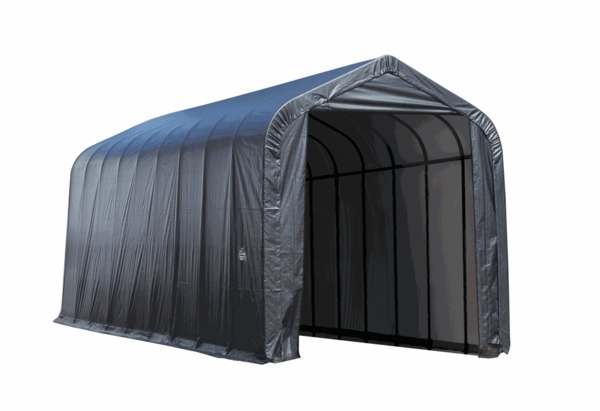 This outdoor garage from Shelter Logic provides enough room for 2 cars or a large boat, and the sturdy steel frame gives enough support to keep the portable garage stable even through strong winds and harsh weather conditions. I'm looking for a canopy such as this for our boat. On the trailer, it has a mast that in its lowest is 13' 4" high. How would I get it in and out? Under "FEATURES" is says 13'4" door height, but the scale diagram shows it as 12'6". Which one is true? Where are the "(2) Double zippered door panels" located? Are they at each (both) end, or is one on the side, or both part of the single front door? Is the zipper feature such that one can be used as a main door? The double zippered door panels are located at each end of the canopy. They are two large, single flap doors, as shown in the image. Per the manufacturer, the door height is actually 12'6" for the ShelterLogic 14x36x16 shelter.